Are these sold in a 'direct thread' configuration, where I can just screw it and shoot or does it need additional optional hardware before I can attach it to a firearm? The SilencerCo web site refers to a "thread mount" as well a "muzzle brake attachment" and "ASR QD mount". They have multiple attachments options that thread into the rear of the can. You can get a direct thread mount which will fit any number of thread pitches, or you can get the more expensive quick attach option with the ASR. It makes more sense if you go to the accessories portion of their website and look at the mounts themselves. Thank you, I already did. 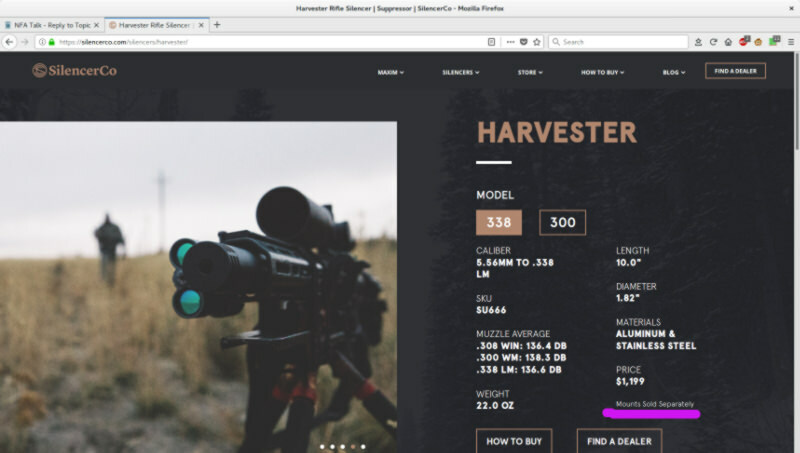 I cannot determine from the verbiage on their web site or manual whether the can comes ready to mount from SilencerCo without having to buy an additional cost item, be it direct thread ("thread insert") or Q mount. The thread inserts are close to $90 each, and the other mounts are over $110 each. Thanks! I only looked at that page four times, but didn't notice that blurb. With that settled, does anyone have experience with it? No, but for what it’s worth I have two Omegas that I’ve been immensely pleased with. Thanks. I really like my Osprey .45, especially with FN FN-X Tactical. For .308Win. (and 6.5 Creedmoor), I use an Elite Iron Bravo 1. I want something for rifles between .308Win. and .338.